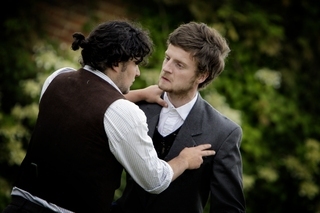 Andrew appeared as Adam, Orlando’s servant, in the Oxford School of Drama‘s production of Shakespeare‘s As You Like It at Blenheim Palace in June 2009. The rural idyll of Blenheim Palace is the perfect setting for As You Like It. The witty romantic comedy is being performed in the open air by the Oxford School of Drama. It is hard to imagine a better ‘Forest of Arden’ , with flowers and vines as a backdrop, birds twittering and the last rays of sun falling on to an audience seated on bales of hay. The play is centred on characters exiled from the court who take up residence in the forest among shepherds and country folk. Rosalind (Gabriella Best), who is banished from the court, disguises herself as a boy and in this guise wooes Orlando (Tom Leeper), who is also living in exile. Much comedy is provided through the bumpkins Silvius (Daniel Hallissey) and Corin (Sam Miller), the fool Touchstone (Dominic Ross) and the melancholy wit Jacques (Marie Westcott). Hallissey and Miller give spirited comic performances which made the audience laugh out loud. Charlotte Hunter plays Celia in a vivacious and likeable way and Chris Gunter has a powerful stage presence and dynamism as the Duke. The cast dress in modern costume, from stylistic power suits to leopard print leggings, and tents are used by the forest dwellers. The production stands out because of the way that music is intertwined with the action. The actors play guitar, violin, drums and sing beautifully. The Goddess of Marriage Hymen (Bishanyia Vincent) is a soul diva who sings her lines with real personality and class. The action was lively and physical at times. The fight between Orlando and Charles (Michael Amariah) was extremely well choreographed making it exciting and fun to watch. The performance culminated with rock and roll-style dancing and fireworks. The student actors recreate the ‘rustic revellery’ of the play effectively and make it an entertaining and vibrant show.